Massachusetts Institute of Technology (MIT) researchers have found an easy way to tackle recurring oil spills at sea. MIT has developed a nanowire miracle membrane to absorb oil from water. a membrane of nanowires that is as thin as a paper can absorb up to 20 times its weight in oil. the membrane is made of potassium manganese oxide and is stable at high temperatures. 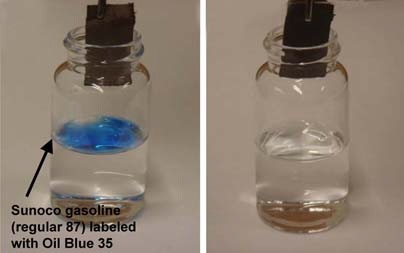 the oil itself can be recovered from the loaded membrane by heating above the boiling point of oil. can be recycled many times for future use. can also be used for filtering and water purification. inexpensive as mass production is possible using nanomaterials. the nanowire membrane has many tiny pores that make for good capillarity, or the ability to absorb liquids. a water-repelling coating on the membrane keeps water from penetrating into the membrane. in water it remains dry as long as there is no oil in the water. The nanowire membrane will be having advantages over super absorbing Imbiber Beads in terms of cost, recycling, oil recovery. Here is a photo that demonstrates removal of a layer of gasoline (dyed blue) from a vial of water by nanowire membrane. Image courtesy: Francesco Stellacci, MIT and Nature Nanotechnology. For more information,images and video clip visit mit news.